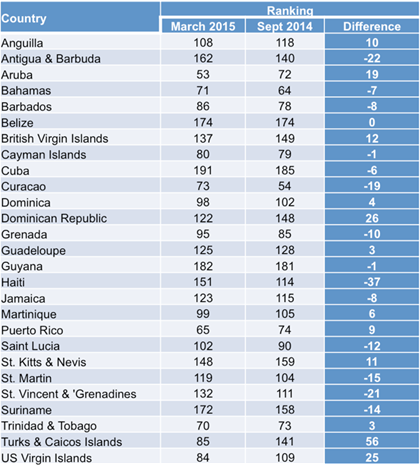 An update of actual Internet download speeds in 27 Caribbean countries and a comparison of results recorded in September 2014. In May 2014, we launched a new Snapshot that presented actual (real life) upload and download speeds from across the Caribbean. In light of the dynamic nature of the Internet globally, and even in the Caribbean, the exercise was repeated in September. In this post, we update the actual Internet download speeds from across the Caribbean, and compare them with those recorded in September. The methodology that has been used for this assessment has remained the same. The data was drawn from Internet speed tests conducted by Ookla, a recognised provider of broadband testing and web-based network diagnostic applications. Using the results of its speed test applications, it is able to continuously track Internet speeds and performance globally. Ookla has formulated two indices – a Household Upload Index and a Household Download Index – which compares and ranks consumer upload and download speeds worldwide, and represents them as a rolling mean speed in Megabits per second (Mbps) over the past 30 days. The results presented in the next section were recorded on 17 March 2015 for the countries listed in Table 1. 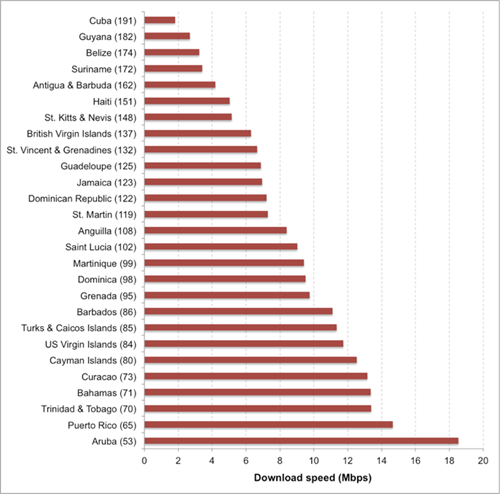 Internet download speeds continue to vary considerably across the 27 Caribbean countries examined, as shown in Figure 1. The fastest download speed was recorded in Aruba, which was ranked 53rd out of the 198 countries assessed, at 18.53 Mbps, and was followed by the Puerto Rico at 14.66 Mbps, which was 65th on the list, and Trinidad and Tobago at 13.38 Mbps, which was 70th on the list. At the other end of the spectrum, the slowest download speeds were recorded in Cuba, 1.81 Mbps, which was 191st, and thereafter, Guyana, 2.69 Mbps and was ranked 182nd, and Belize, at 3.23 Mbps, and 174th out of 198 countries. What changes have occurred since September2014? 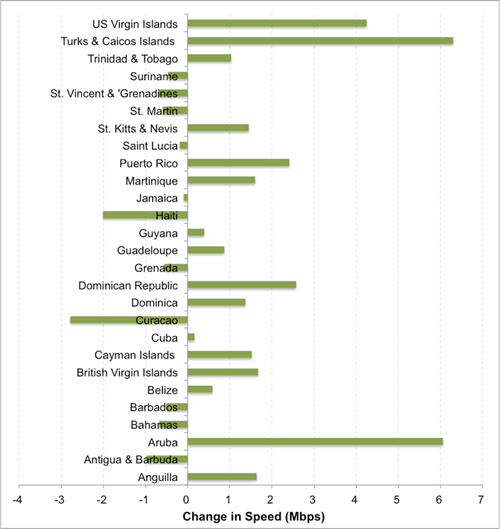 With regard to the changes in household download speed in individual Caribbean countries, they varied widely, as shown in Figure 2. 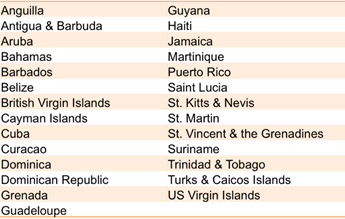 The greatest increases in downloads speeds were recorded in the Turks and Caicos Islands, by +6.30 Mbps, and followed by Aruba, by +6.06 Mbps, and the Unites States Virgin Islands, by +4.25 Mbps. On the other hand, 11 countries recorded a decrease in their household download speeds. The top three were: Curacao, with a drop of -2.79 Mbps; Haiti, where the average download speed slowed by -2.01 Mbps; and Antigua and Barbuda, with a decrease of -0.98 Mbps. With regard to country ranking in the global index, the 11 countries that recorded lower averaged download speeds, also slipped in the country ranking as reflected in Figure 3. However, two additional countries, the Cayman Islands and Guyana, also lost their earlier positions, though they both recorded increased download speeds. Also, Belize, which recorded an increase in download speed of 0.59 Mbps, was only able to maintain its May ranking, at 174. This entry was posted in Media, Small Island. Bookmark the permalink.